ATP doubles specialist Eric Butorac won't be competing at the BNP Paribas Open this year, but he says Indian Wells is the best doubles event of the year. Editor's note: A version of "Training with Novak" originally appeared on Universal Tennis as part of a series of accounts shared by Eric Butorac, ATP Player Council president and an accomplished doubles specialist. As I’m currently the ATP’s No. 45-ranked doubles player, I’ll be watching the BNP Paribas Open in Indian Wells from my couch this year. The influx of singles players using their singles rankings to sign up for doubles makes the doubles cut in Indian Wells as tough as at any tournament in the world. This year, you need a combined ranking (one partner’s ranking + the other partner’s ranking) of 73. People often ask me if that is frustrating. Of course it is, especially for my bank account. But in addition to being a player, I’m a fan and supporter of the game, and I love seeing it thrive the way it does in the California desert. 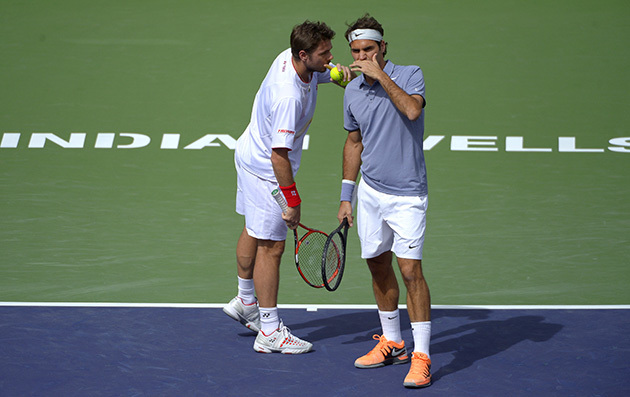 For the following reasons, I believe Indian Wells is the best doubles event of the year. Federer, Nadal, Murray. These are the names you often see on the doubles courts at Indian Wells. The following event is in Miami, so it’s not too far to travel, and most players won’t go home beforehand. Many arrive from Davis Cup, which is played on various surfaces, and are looking for additional matches to get used to outdoor, hard-court conditions. With singles stars abounding, we can start to answer the great question: Can the best singles players in the world beat the best doubles teams? (My answer is…sometimes.) Watch Indian Wells this week to see this get put to the test. For example, in the first round, the Bryan brothers, two-time Indian Wells champions, meet two Spanish pals, Rafael Nadal (also a two-time champ) and Fernando Verdasco. The combination of the fast desert air and the slow gritty courts allow all styles of play to be effective. Serve-and-volley or grind from the back; anyone can win. Tournament owner Larry Ellison has also added Hawk-Eye to all match courts, nearly ensuring that matches won’t be won or lost on bad calls. 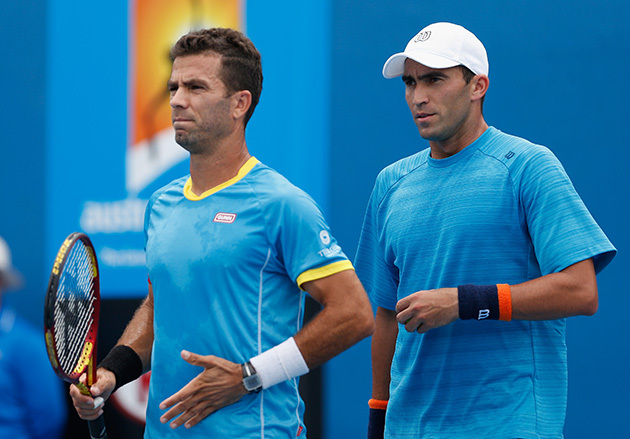 Jean-Julien Rojer and Horia Tecau sit atop the men’s draw as the No. 1 seeds, but Marcelo Melo, the No. 1-ranked individual doubles player since last fall, is half of the No. 2-seeded team along with his longtime partner Ivan Dodig. The new pairing of Bruno Soares-Jamie Murray won the Australian Open, but haven’t played since. Jack Sock–Vasek Pospisil are the defending Indian Wells champs and have proven several times that they can win on the big stage (see Wimbledon 2014). 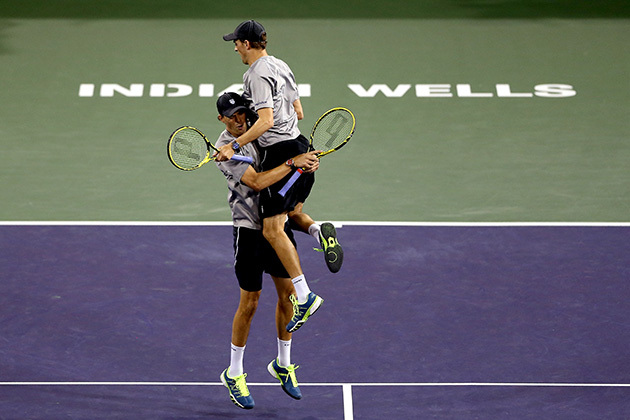 After their five-set Davis Cup victory, you can also be sure that the Bryans intend to be back on top before long. Andy Murray-Colin Fleming, Steve Johnson–Sam Querrey, Richard Gasquet–Benoit Paire. Just as fans enjoy a spring holiday in the desert, players get a chance to share the court with their good friends. But don’t let the friendliness fool you. These guys want to win. You’ll see countrymen from Poland, Argentina and Columbia getting extra fired-up this spring in hopes of bringing a gold medal home from Rio this summer. I think Indian Wells actually missed a trick here because they could have held a mixed-doubles event. Nadal-Muguruza vs. Paes-Miza? Who is going to miss that one?